The finals of the Dialog President’s Gold Cup Volleyball Tournament (two categories – men and women) will take place on December 15 at the National Youth Council (NYSC) Indoor Courts, Maharagama from 8.30am. 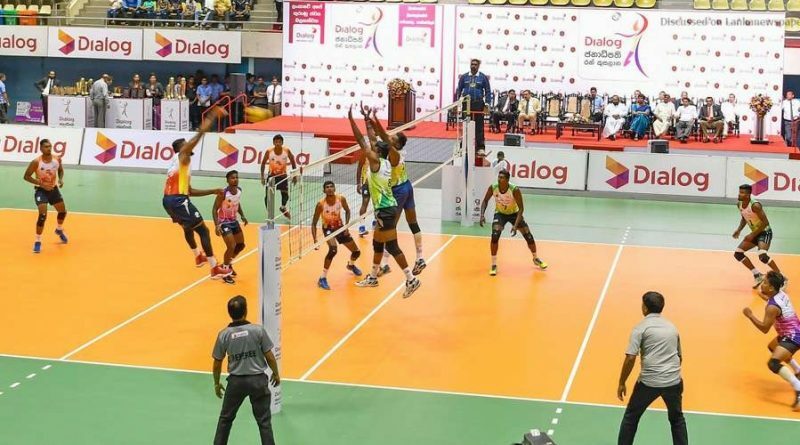 The tournament is being conducted by the Sri Lanka Volleyball Federation and sponsored by Dialog Axiata PLC. This is an islands wide tournament where over 1,000 teams participated under the following categories: Under-22 and Open (Men and Women). All winning teams will be in line for cash awards of Rs 150,000 while the runners-up teams will receive Rs 100,000. The third place winners will receive Rs 50,000. Wijeba Sports Club Hungama and Davisamara Sports Club Seeduwa bagged the third places in the Under-22 women and men’s competitions. Golden Birds Sports Club Radhawana and Rameez Travels Sports Club Anamaduwa were placed third in the Open women’s and men’s contests. 8.30am: Under-22 Women’s Final – Ratanapala Sports Club Mahauswewa vs. Alamona Sports Club Kegalle. 10.30am: Under-22 Men’s Final – Rajasinghe Sports Club Ruwanwella vs. Dhammisara Sports Club Nattandiya. 2.30 pm: Open Women’s Final – Casualline Sports Club Kurunegala vs. Wijeya Sports Club Koswadiya. 4pm: Open Men’s Final – Balaras Sports Club Colombo vs Siyanatharu Sports Club Gampaha.